sql.sasquatch: Hey! What's the deal with SQL Server NOCOUNT and T-SQL WHILE loops? Hey! 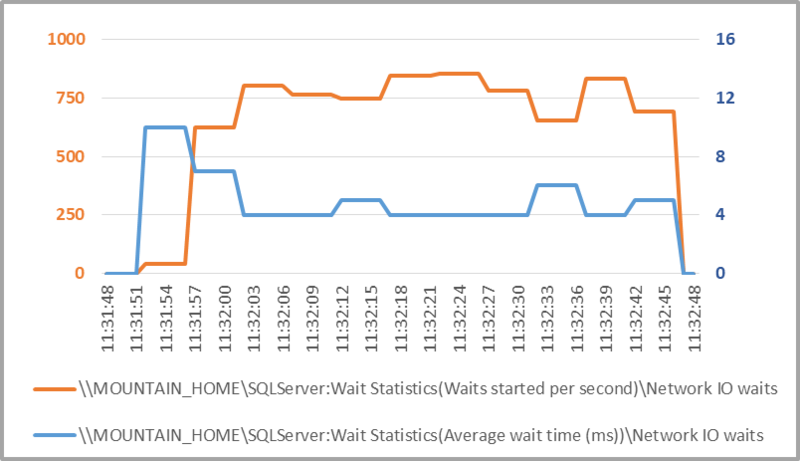 What's the deal with SQL Server NOCOUNT and T-SQL WHILE loops? OK. I like logging a lot of information for my tests. And I've got a stored procedure for my test workload. This is after a few revisions - there's a couple of important comments in there that maybe someday I'll be able to explain more adequately :-) Why count to 8000000 in the loop by default? It was an early estimate for 10 seconds of solid CPU work on this system, and I wasn't motivated enough to bump it higher once I saw that it fell a little short once NOCOUNT was ON. But I don't want to spill the beans early. So... here's the stored procedure. OK, still need a driver for the tests. I'm old as the dinosaurs so I usually throw together a .bat script before Powershell. I put together a pair of .bat scripts, one for NOCOUNT OFF (default) and one for NOCOUNT ON. These scripts resided on my laptop, and will be executed from my laptop, with a remote connection to SQL Server via sqlcmd. They looked like this. The timed_count__reg_2 stored procedure does a fair bit of self-logging, but whenever possible I like to keep eyes-on from outside the individual test sessions as well. Plus, I really like perfmon. So, on the SQL Server RDBMS VM I have a Sasquatch directory. Its got a .bat script for starting logman and a text file for the counters to log. And a .bat script to stop the counter collection. For this type of test, I typically use a one second collection interval. Fire up the Sasquatch collector. First executed the script with NOCOUNT OFF. Then executed the script with NOCOUNT ON. Stopped logman. Let's see what I've got. I'm glad that worked out. The first test was with NOCOUNT OFF. It ran about 50 seconds. The second test was with NOCOUNT ON. It ran really hot on the CPU, in less than 10 seconds. There's something goofy about the CPU vs elapsed numbers for that particular run... that'll have to be for another day. That's exactly the ASYNC_NETWORK_IO waiting_tasks_count for the first test's session_id 55. And no ASYNC_NETWORK_IO waits recorded during the 2nd test with NOCOUNT ON. Not at session level, not at system level. So NOCOUNT made a big difference here. Huh.